President-elect Donald Trump is seen arriving at an election night rally in New York on Nov. 9, 2016. 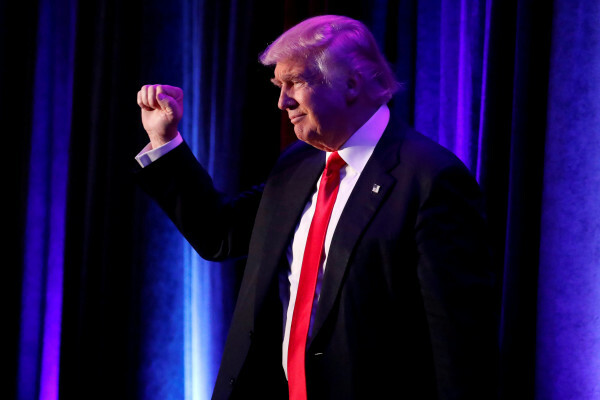 WASHINGTON — President-elect Donald Trump accepts the U.S. intelligence community’s conclusion that Russia engaged in cyberattacks during the U.S. presidential election and may take action in response, his incoming chief of staff said Sunday. It was the first acknowledgment from a senior member of the Republican president-elect’s team that Trump had accepted that Russia directed the hacking and subsequent disclosure of Democratic emails during the 2016 presidential election. Trump had rebuffed allegations that Russia was behind the hacks or was trying to help him win, saying the intrusions could have been carried out by China or a 400-pound hacker on his bed. With less than two weeks until his Jan. 20 inauguration, Trump has come under increasing pressure from fellow Republicans to accept intelligence community findings on Russian hacking and other attempts by Moscow to influence the Nov. 8 election. A crucial test of Republican support for Trump comes this week with the first confirmation hearings for his Cabinet picks. A U.S. intelligence report last week said Putin directed a sophisticated influence campaign including cyberattacks to denigrate Democratic presidential candidate Hillary Clinton and support Trump. The report, commissioned by Democratic President Barack Obama in December, concluded vote tallies were not affected by Russian interference, but did not assess whether it influenced the outcome of the vote in other ways. After receiving a briefing Friday from leaders of the U.S. intelligence agencies, Trump did not refer specifically to Russia’s role in the presidential campaign. Trump spokesman Sean Spicer told Reuters the president-elect’s conclusions remained the same and that Priebus’ comments were in line with Friday’s statement. Priebus’ wording did not appear to foreshadow the dramatic reversal of Trump’s apparent Russia policy that experts say would be required to deter further cyberattacks. Priebus, the former Republican National Committee chairman Trump tapped as White House chief of staff, said Trump planned to order the intelligence community to make recommendations as to what should be done. “Action may be taken,” he said, adding there was nothing wrong with trying to have a good relationship with Russia and other countries. Two senior Republican senators urged Trump to punish Russia in response to U.S. intelligence agencies’ conclusion that Putin personally directed efforts aimed at influencing the election. Appearing on NBC’s “Meet the Press,” Sens. Lindsey Graham and John McCain said evidence was conclusive that Putin sought to influence the election — a point that Trump has rebutted. U.S. Rep. Devin Nunes, the Republican chairman of the House Intelligence Committee, said three U.S. presidents had tried and failed to be friends with Putin. Obama, who himself tried to “reset” relations with Russia after he took office in 2009, told NBC he did not think he had underestimated the Russian president. “But I think that I underestimated the degree to which, in this new information age, it is possible for misinformation for cyberhacking and so forth to have an impact on our open societies, our open systems, to insinuate themselves into our democratic practices in ways that I think are accelerating,” he said in an interview on “Meet the Press” broadcast Sunday.